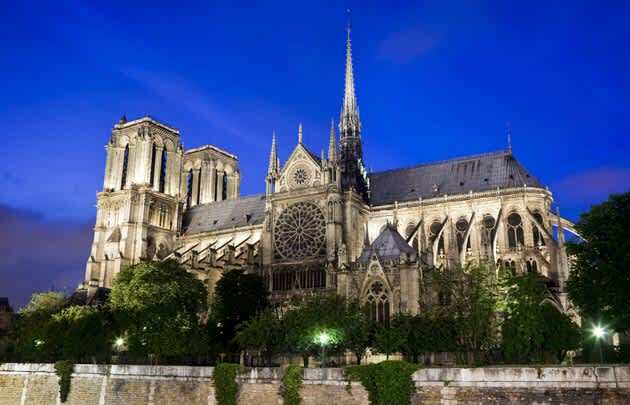 Democrats Abroad France stands in solidarity with the people of Paris and of France as Notre Dame burns this evening. We honor the firefighters and police for their efforts to save this extraordinary edifice, appreciated around the world as a symbol of French history, culture, art and humanity and acknowledged for its beauty. We encourage the Americans of France to join our French friends and families in the effort to rebuild Notre Dame, as President Macron has pledged the French Nation will do. June 6th, 2019, is the 75thanniversary of the Allied landing in Normandy, marking the beginning of the end of WWII and the liberation of Europe. There will surely be plenty of commemorative celebrations in Normandy, although given the expected large crowds, road closures and concerns for security, it’s important to plan ahead. It’s doubtful anyone we’ll be able to pitch up on the day of and get access. Our members have elected their local leadership for the twelve DA France chapters! Congratulations to the new Chapter leadership and thank you to the outgoing leaders who have contributed their time and energy to build DA France and to power the Blue Wave in 2018. Please take a moment to scroll down and meet our local leadership teams in Paris, Toulouse, Marseille, Riviera, Avignon, Grenoble, Lyon, Strasbourg, Bordeaux, Brittany, Normandy, and Montpellier. Click on the chapter name to visit their webpage for news and events. You can also find many DA France chapters on Facebook. In 2019, we also welcome two new chapters to DA France - Paris and Montpellier! Paris? Yes! We now have in place the organizational structure for a chapter with a dedicated leadership team to engage and mobilize the progressive American community in the nation’s capital. We have a talented and motivated group ready to create a vibrant Paris chapter. The DA France Elections Board is pleased to present the list of candidates for the upcoming DA France National elections. Please continue reading to see all of the candidates and their statements. ELECTIONS WILL BE HELD Saturday, May 11, 2019 at the American Church in Paris from 2:00 P.M. to 5:00 P.M. To RSVP and for more details, please see here. Early voting by online ballot will also be made available to DAF members via email. This is optional. You will receive your Absentee/Early Voting ballot soon with instructions on and deadlines for early voting. One can either vote in person by attending the meeting or by voting early. Watch this space for more election information. If you do not receive emails for the Call for Candidates and Election notice and Early Vote/Absentee Ballot, that means that you have chosen in the past not to receive emails from Democrats Abroad (or perhaps we do not have your current email address). ✔️ If you would like to opt-in to receive emails, please go to www.democratsabroad.org. Under Account Settings you can change your privacy preferences and check that we have the correct email address on file for you. ✔️ If you are not yet a member of Democrats Abroad, it is quick and easy to join. Just go to www.democratsabroad.org. Your vote for our Country Committee and Chapter leadership will help ensure that we serve your needs and interests as a Democrats Abroad member. Please note that all DAFrance members can attend the National Election Meeting** to vote in person. For more information on this meeting and to RSVP, click here. If you do not wish to receive our regular emails, you can still receive your ballot via email or postal delivery by contacting the DAF Election board at electionboarddaf@gmail.com. * The Call for Candidacies with for the national executive committee can be found here. ** For information regarding local chapter elections, check with your chapter leadership or click here. UPDATE: The nominations period is now closed. and how to Vote in the DAF National Elections, CLICK HERE! on May 11, 2019, CLICK HERE! Spring is almost here...and so are the elections for Democrats Abroad France chapter leadership. 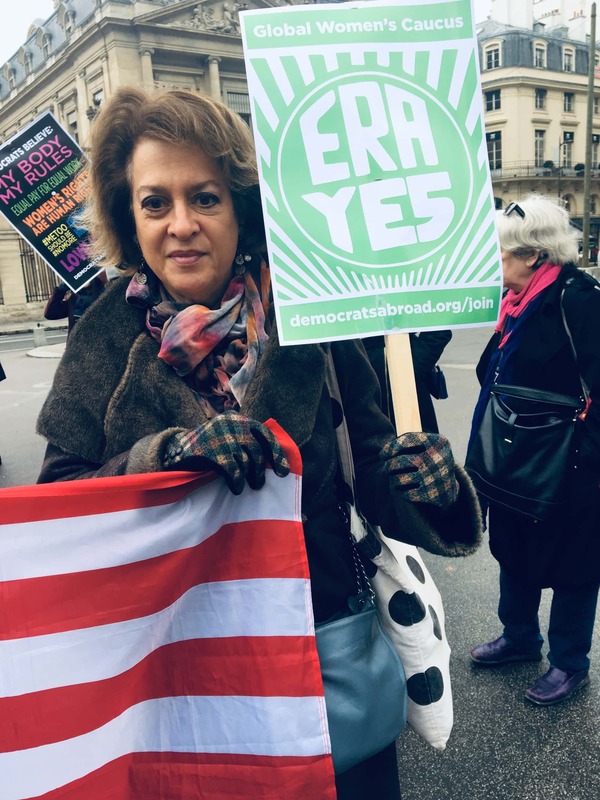 Throughout March (and early April), the eleven chapters of Democrats Abroad France will hold elections for the local leadership. In most cases, the call for candidates has gone out from the chapters. In many cases, there is still time to send in your candidacy. Here is a list of our chapters - some old, some new - and the dates of their elections. Click on your chapter to be directed to the webpage with specific local information. Feel free to contact your local chapter leadership for more information on the elections. 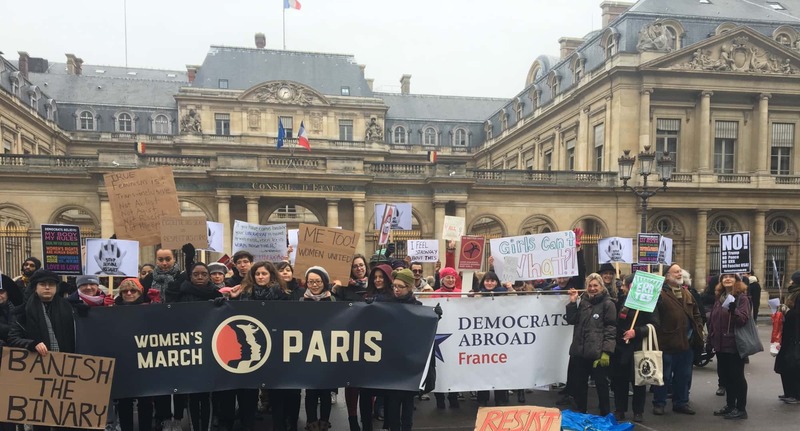 We encourage all Democrats Abroad France members to get involved in your local chapter in 2019! Through the efforts of our local volunteers, DAFrance helped to drive the high level of overseas voting in the 2018 mid-terms that changed the direction of American politics. However, our Get Out The Vote (GOTV) and other activities don’t come without the sustained efforts of the chapter executive committees. With Democrats winning the House of Representatives in 2018, we must keep the momentum of our voices being heard loud and clear. 2020 is going to be another critical election year for the Democratic Party...and for our country! We need as many members as possible involved on a local level. Even if you choose not to run for a leadership position, we encourage you to vote and to attend your chapter's election...you can meet the new leadership and other DA France members from your community. Please note these are local elections which are independent of the national election for the DA-France Executive Committee to be held later this spring. Black History Month Discussion: "Is America Now a Refuge for French Blacks?" France has long been a welcoming haven for African-American artists, from Henry Osawa Tanner to Dexter Gordon. Is the United States now a refuge for France's blacks, playing a similar role in reverse? 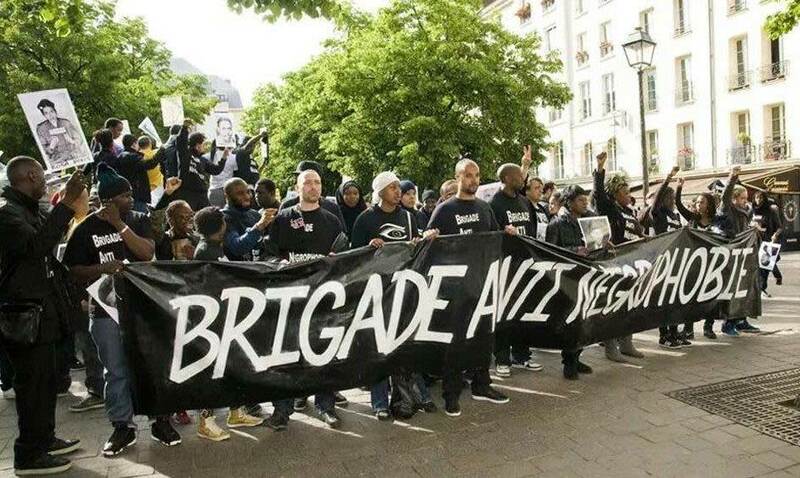 As the presence of Africans and Afro-Caribbeans has grown in France in recent decades, tensions have risen between the descendants of immigrants and the native population. The visibility of blacks in professional and public positions is limited. Socio-economic inequality and problems with police are very similar to those in the United States. Increasingly, French blacks have turned to the U.S. for inspiration and opportunity. Intellectuals have found teaching opportunities in the U.S. Activists have sought inspiration in the political strategies of African-Americans. Democrats Abroad France - Diversity Caucus will be hosting a discussion focused on black history in France on February 28th. We will be welcoming journalist, author, filmmaker and activist Rokhaya Diallo in a discussion moderated by author, journalist and all-around "man of the world" Joel Dreyfuss. About Rokhaya Diallo: Journalist and author, she devotes her work to issues related to racial equality. She has published "How to Talk About Racism to Children" and "Afro!" with the photographer Brigitte Sombié. Ms. Diallo has directed several documentaries including "The Networks of Hate" devoted to cyberbullying and "From Paris to Ferguson: Guilty of Being Black" about police violence in France and the United States. To read more from Rokhaya Diallo. This discussion will focus on the peculiar status of blacks in France, their perception of African-American progress and the challenges of developing a successful strategy for full equality in France. We are asking for an optional donation of 5€ to help us cover the costs of the event. As has been announced previously, DAF's new Paris Chapter will conduct its first Leadership Election on March 9, 2019 (at the American Church in Paris, from 2-5PM). Women's March Rally: View From Paris. Our theme was VIOLENCE, in all its forms, against women. "Sexual violence is a global epidemic that is all around us, yet it is nowhere, precisely because it permeates every facet of our presence in the world, echoing throughout political and popular cultures, ricocheting off the cement walls that define our boundaries." - Michele Chen from Roxane Gay's "Not That Bad." We need and Equal Rights Amendment to protect women against violence. Laws alone do not solve the problem. 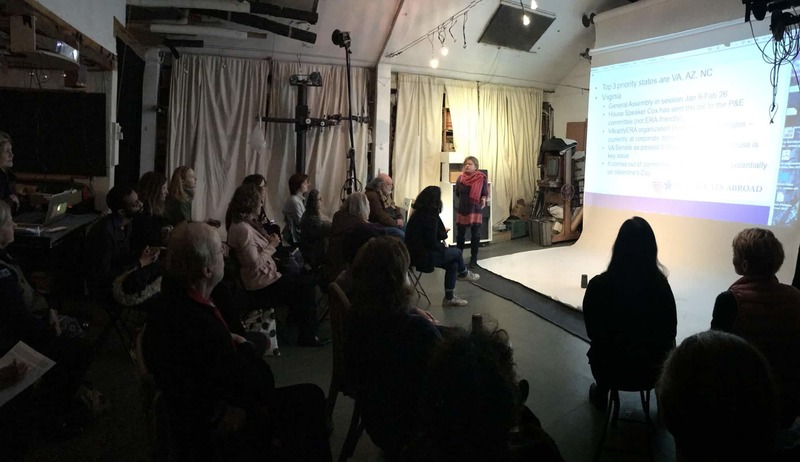 Salli Swartz leads the discussion about the ERA that followed the viewing of the documentary Equal Means Equal, answering the question: Why, in the year 2019 with so many opportunities for American women, do we need the Equal Rights Amendment?